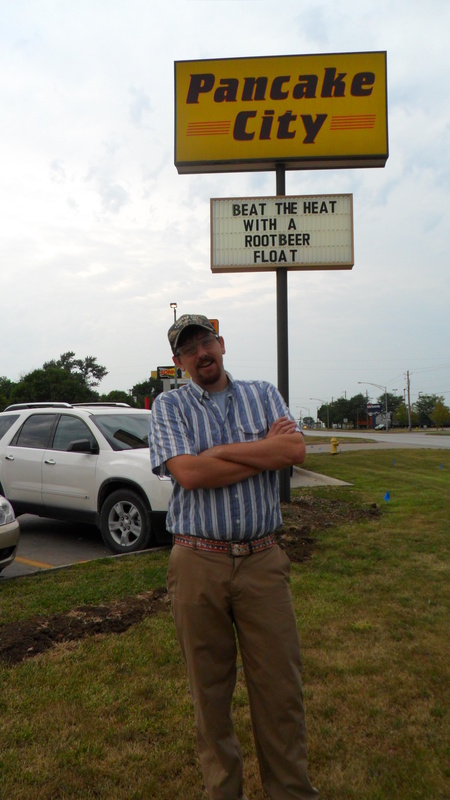 August 26, 2012 – 11:05 A.M.
We’re back on the Panclog wagon. This week’s treat brings us to Simply Breakfast. Simply Breakfast is located in the historic Westport district of Kansas City, Missouri (4120 Pennsylvania Ave, Suite 9, Kansas City, MO 64111). They’re open Monday-Friday, 6:30am-1:30pm, and Saturday-Sunday, 12:00am-7:30am and 7:30am-2:30pm. They do offer call-in pickup, as well as delivery for the Westport and Plaza areas on Saturdays. They offer a 10% discount on your first visit if you check in with the Foursquare app. They also have a reward for the Foursquare “mayor.” Additional information can be found at their website. Location/Environment: In the heart of Westport, Simply Breakfast is very easy to find. However, parking can some times be a pickle in the urban cluster of Westport. Nevertheless, on a busy Sunday morning we didn’t have too much trouble. The restaurant has a very cheery feel from the moment you walk in. The bright, vibrant colored walls are adorned with local artists’ work. The plates your food is served on are a deep orange. It was busy and a tight squeeze for a Sunday morning crowd, but not disrupting to a cherished meal with friends and family. There’s no music to enhance the ambience, which might make Simply Breakfast a bit quiet during the slower hours. Service: Simply Breakfast is a different type of breakfast experience. You don’t have a waiter. Instead, you order from the front counter and are given a number for your table. Your food is then brought out by a restaurant attendant. Drinks and such are self-serve. Coffee is served behind the counter, which could make refills troublesome during busier hours. With limited space, they are quick to bus and clean tables for new guests. Menu/Selection: The selection is somewhat limited, however you’ll find most of your breakfast staples (pancakes, biscuits & gravy, omelets, french toast, egg’s Benedict, oatmeal, etc.). Sadly, waffles are not simple enough for Simply Breakfast. They offer two different batters for their pancakes, sweet cream and multigrain. They also have daily chef’s specials which are not listed on the menu. The menu can be viewed here. The Panclog has been experiencing breakfast in a number of different ways. I have undoubtably declared my major in Pancakes. I have been enjoying pancaking left and right. I have tried pancakes with the toppings on top, toppings mixed into the batter, and a completely different batter in itself. The latter has to be the most difficult to achieve success with. I am always surprised when a brunchery builds their menu around this new type of pancake. If you are dumb and you do not know what type of pancake is the “usual” type, it is Buttermilk. 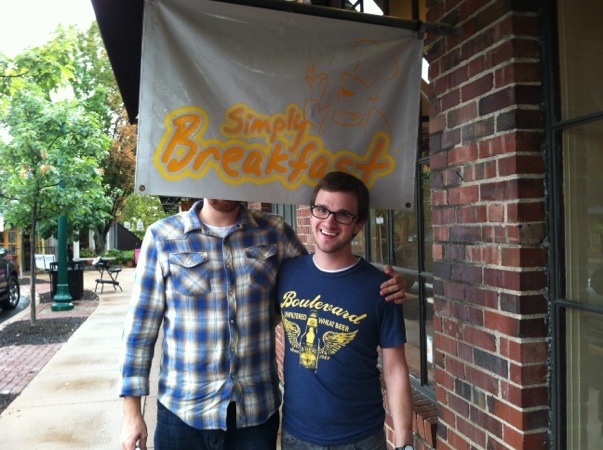 Simply Breakfast has built their business around the Sweet Cream pancake. These pancakes are more cake-y than the other pancakes. This taste sometimes causes dessert messengers to go to your brain and dance. The sweet cream pancakes can be perhaps a little too heavy. The underside of the pancakes were a bit crispy which I actually enjoyed. Having a bit of crunch is never a bad thing. These cakes are something to be enjoyed. Four pancakes are $5.49. One thing I really enjoyed about the presentation of the meal was the use of metal cups for the dollop of butter. The metal allows the butter to start melting without causing a mess on your pancakes. Melted butter is very easy to spread. The amount of syrup I was portioned left something to be desired. And that something was more syrup! I hate hashbrowns. Simply Breakfast’s silverware seemed cheap. The forks were way to weak for shanking your pancakes. I ordered the pancake platter which included two cakes, hashbrowns, and your choice of bacon or sausage for $6.49. I’m a bacon kind of guy, that’s what I do. The sweet cream pancakes were fantastic. I really enjoy pancakes, but I usually order french toast or waffles just because of pancake exhaustion. “What is pancake exhaustion?” you might ask. Pancake exhaustion is that third or fourth cake. The one that doesn’t taste special. The one that makes you sick. It’s the cake that says to your face, “Why’d you choose pancakes, boy?” I suffered absolutely no pancake exhaustion with these sweet cream cakes. They were delicious, sweet, and dense. I could have eaten them without any syrup or butter, which is something I’d never say about an ordinary buttermilk cake. The bacon was your standard bacon. Nothing special to report. In retrospect, I should have ordered a stack of just the sweat cream pancakes like my main man Jared. I hate hashbrowns. Nothing against the potatoes themselves or people who love hashbrowns, just not my thing. However, all is well because the two pancakes and bacon were plenty to fill me. The platter also came with coffee included, which I like. Many times I want coffee but don’t order it because I don’t want to pay the extra two bucks for a cup. With it included, it’s less expensive. Either that or I don’t have a choice to not get coffee. I’m not sure which. Either way, I’m good with it. Price: Pricing is pretty congruent with similar bruncheries. In a city environment like Westport, the pricing could easily be higher. With the Foursquare discount, it’s definitely lower priced than it’s competition. You don’t have a waiter, and drinks are self service, but it shouldn’t be an issue for most. Overall: Simply Breakfast is a solid choice for a mid-morning brunch or a late night meal. With affordable pricing, moderately quick service, and tasty food, you’ll be happy with your experience. With a few tweaks, it could be the talk of the town. First off I should apologize to the fine readers of the Panclog. Stephen and I have been busy and forgot what is truly important in life; Pancakes. I hope this post finds you in a great place in your life. If you know where Kirksville, Missouri is you know that the activities of the town is somewhat limited. This is why whenever I am near to this quaint little village, I am bound to end up in the diner that is perfectly named, Pancake City. My wife was the one who introduced me to Pancake City. We go back to see her family whenever we can. Pancake City is a 24 hour(ish) diner in Kirksville, MO. Their address is 2101 N. Baltimore Street Kirksville, MO 63501. I said 24 hours(ish) because 2 years ago they started closing Sunday nights. They close on Sundays at 9 PM and open again at 6AM on Monday. 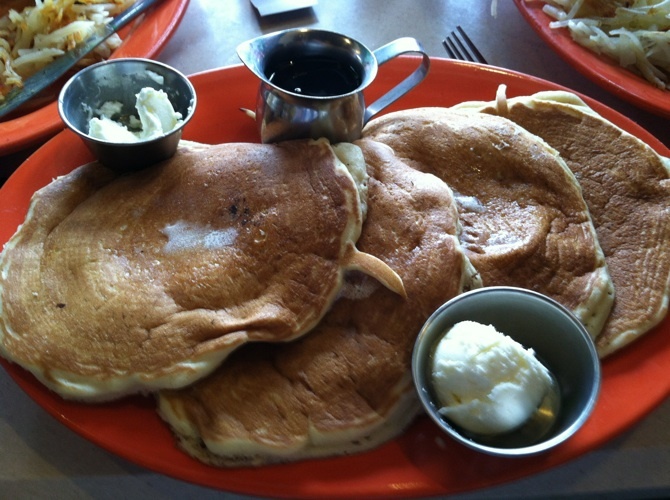 Pancake City is a food staple of students of Truman State University. You can find additional information and GAMES on Pancake City’s website. 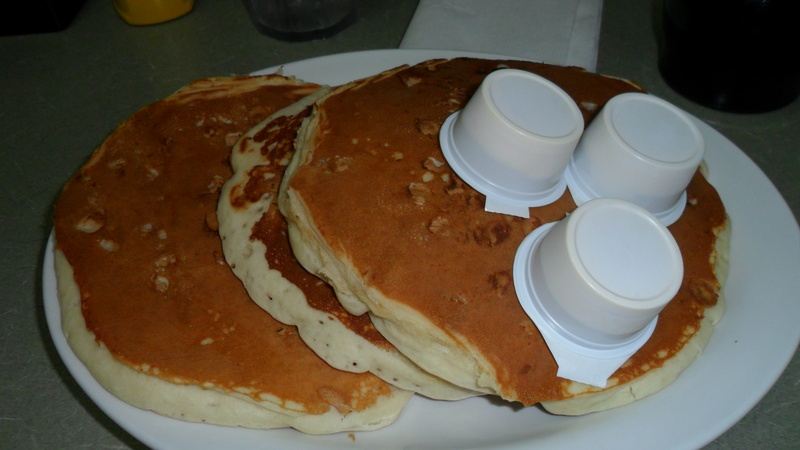 Location/Environment: Pancake City is located on Kirksville’s main street, Baltimore, in the North-side of town. It is very easy to find and they have their own parking lot. Pancake City is a seat-yourself type diner. The restaurant was not busy at all. It was early enough on Sunday that we did not see any of the After- Church Rush. Service: Pancake City was opened in 1983. They wanted a home-away-from-home feel to their restaurant. All of the guests seem to be known by the wait staff. The staff was very helpful to my quest to find the best pancakes. Nobody was overly friendly but did a good job at making us feel welcome. Pancake City also has Free WiFi! This makes my little heart so very happy. I am poor, therefore I do not have a smartphone. But I use WiFi whenever I can. During the meal the waitress came to our table and said “Is everything delicious?” Yes, yes it was. 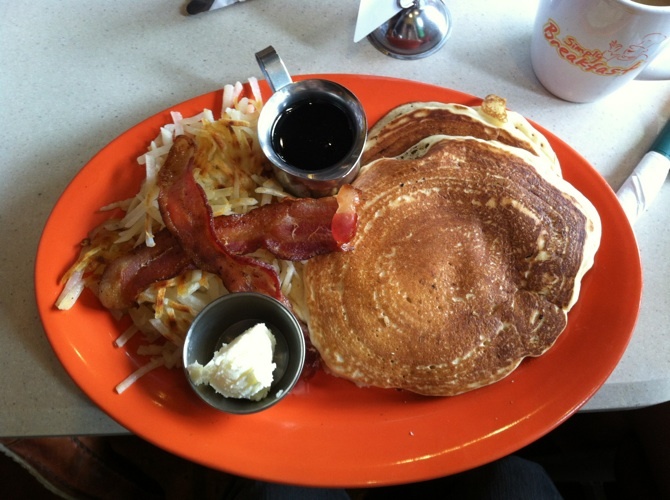 Menu/Selection: Pancake City’s menu boasts an impressive 9 varieties of pancakes. They also have All-You-Can-Eat Spaghetti on Mondays and All-You-Can-Eat Shrimp on Tuesdays between 5-9 PM. Pancake City uses a “California Menu” which means they will make anything on the menu at anytime during the day. They have something for every meal time. These Pancakes are made just the way I like them, with the ingredients insidethe batter. This Platter (short for 3 pancakes) was made with peanut butter chips. The pancakes were approximately 6″ in diameter. They were served with 3 single servings of whipped vegetable oil. This is very similar to butter, but is supposedly better for you due to the lack of chunky fat cells. These pancakes were very thick. Everyone knows once you add syrup to these tasty treats they become even more thick. They were so rich and hearty that your stomach hoot and hollered with excitement but quickly urged you to cease your delicious ways. I hope you like your syrup maple-y. Because that is all that Pancake City carries. Price: Priced at $5.89, these pancakes, being as thick as they are, were fairly priced. At Pancake City you pay at the front of the restaurant. This is common practice at diners. Whilst paying you will most likely notice the wall of Pancake City merchandise. This caught my eye as you can see in the picture of me outside this nice establishment. Their merch includes 2 different style hats, a shirt, and a visor! Overall: After trying many different breakfast hubs, I would strongly suggest going to Pancake City when near Kirksville, MO. How many people can say that they have been to the City of Pancakes? That is just a selling point in and of itself. Pancake City holds up well against other small town diners I have been to. Pancake City contains everything that you would see in a 24 hour(ish) diner in a small town. They have the nice grime of an old building and a handful of guests who seem quite belligerent to outsiders.